Cycas revoluta the Sago Palm is a great small palm look alike. The Cycas genus is actually closely related to the pines. They have cones and large seeds that resemble pine nuts. The starch from the Sago Palms trunk and seeds were used throughout the Islands off Asia as a food source. 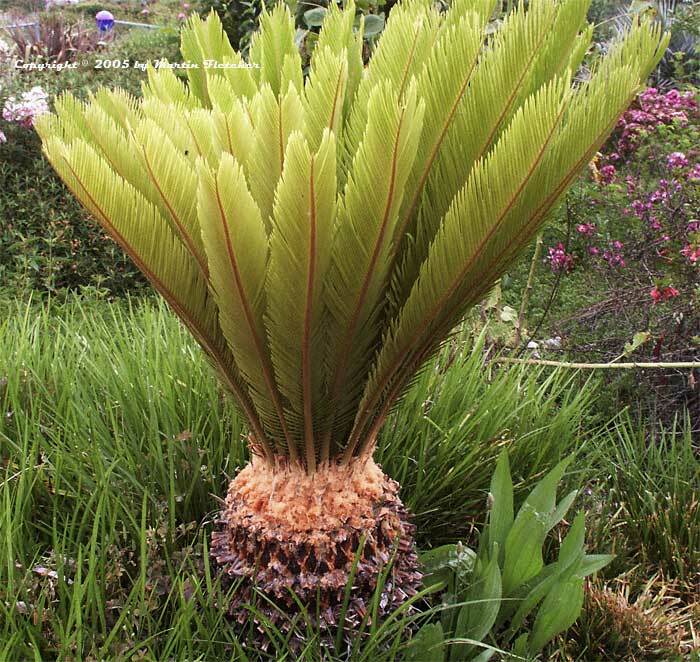 Cycas revoluta is thought to yield imortality to Buddhists that eat it. The new Sago Palm leaves were used to make a tea. Care should be taken to find the proper preparation methods as a number of the cycads produce toxins that must be leached before any parts of the plants can be consumed. This Cycas revoluta is in an area that drops into the low teens each Winter. At this temperature Cycas revoluta will lose all of the leaves. I wait to cut the old Sago Palm leaves off until the new ones appear. The new ones like these will come out in late April and May in our area. Cycas revoluta will produce new pups around the base as it grows. Cycas revoluta was often planted around temples and is a good specimen to use for a pseudo bonsai look as the plants grow very slowly. There is not much that can be done to shape Cycas revoluta plants except to trim off thedead foliage. Flowers and foliage of Cycas revoluta - Sago Palm. High resolution photos are part of our garden image collection.